Football player Jason Emerich is committed not only to his team and his own success in the classroom—where the sport management major has earned an almost permanent spot on the Athletic Director’s Honor Roll—but also to the continued health and success of former team member Rob Long ’12, G’14. The former captain was sidelined by a rare type of brain cancer in 2010, and Emerich has dedicated himself to helping eradicate anaplastic astrocytoma, the disease for which Long underwent brain surgery. Q: How do you help the fight against anaplastic astrocytoma? A: I serve as president of the University’s chapter of Uplifting Athletes, a national nonprofit organization that aligns college football with rare diseases. Each chapter “adopts” a disease that has personal significance to its members. In addition to promoting awareness of anaplastic astrocytoma, my teammates and I are raising more than $15,000 to help find a cure. Recent events have included a “Lift for Life” competition and a private videogame challenge. A fall pledge-a-thon is also in the works. Q: How did you get started in football? A: I grew up in New Ringgold, Pennsylvania, and started playing “tackle football” when I was five. By the time I graduated from Blue Mountain High School, I had been named senior captain, Chesapeake Bowl All-Star Participant, and Pennsylvania Class AAA All-State Offensive Lineman. I was recruited [to Syracuse] by coaches Marrone and Adkins, who were good people. I’ve always felt like I’m part of something. Q: What has been your best moment so far in Syracuse football? A: Last fall’s game against Wake Forest—the one in which I was able to help the Orange rack up 370 offensive yards. That game is still one of my favorites, and my first career start. I thought I played pretty well. Best of all, we won. Q: What are you looking forward to in this upcoming season? A: The one thing I look forward to most is the home-opener against Rhode Island. You can’t get to the next game until you finish the first one. I just want to contribute to our success the best way I can. That’s my role. 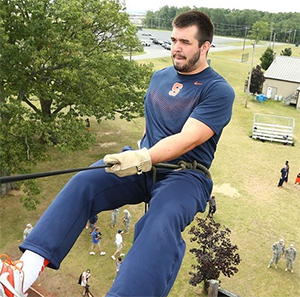 Q: What do you do at Syracuse in addition to football and Uplifting Athletes? A: This summer, I interned for the Chiefs—the Washington Nationals’ Triple A affiliate in Syracuse. After college, I really want to coach football, and interning with the Chiefs has given me hands-on training in sports management and operations and has shown me another side of the industry. It has been invaluable, extending my classroom studies and strengthening my resume.